If you have an iPhone X, iPhone 8/8 Plus, Galaxy S, Galaxy Note, or any other smartphone that supports wireless charging, prepare to meet your new favorite desk accessory. The TaoTronics LED Desk Lamp with Wireless Charger helps you clear the clutter off your desk by killing two very important birds with one stone. 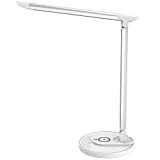 It’s a great LED desk lamp with five different colors and seven brightness levels, and it also has a wireless charger built right into the base. How cool is that!? Note: Please remove all metal cases and metal or magnetic objects from the back of your phone prior to wireless charging, as these may overheat and damage your device.